Anyone else have that pet peeve about strangers telling you to smile more? Although, I think Ina could benefit from the odd winsome smile and some charming words. Apparently the fae folk do respond to a little cajoling. I managed to play around with the site for a bit while in bed with the flu, and look! Refreshed decor. It would be Mission Impossible for Ina to smile. Ha ha, yes. Enjoy herself? No way! Being a smart-aleck teenager must be extremely dangerous for one’s health when you’re near the fae, come to think of it. So glad to see you’re back, and that you’ve got a handle on looking after your doggie! Indeed! Why do the fae put up with it? Thanks, it’s an adjustment but our poor dog is worth it! indeed. i’m not sure why he’s still helping her. i get it, this is slow build up to her eventual character development, but at this rate, he’d have taken off by now. ugh. i’m glad the comic is back and you’re doing better tho! Laisrén's face in the last panel is the bessssstt. Thanks, glad you could rejoin us for more pages! Pup is okay, but not walking well yet. You're doing an excellent job with Laisrén's body language, expressions & personality! I know how hard I find that sort of thing. You're nailing it! Loving the story and my re-acquaintance with it all! Feel somewhat an affinity to it all as have always felt at discordance with the world. So have enjoyed and embraced this tale. Seeing it through Ina’s eyes with her “chip on the shoulder” resounds in my own self even though long ago passed those precious years. Thanks for the new “The Fae” page! 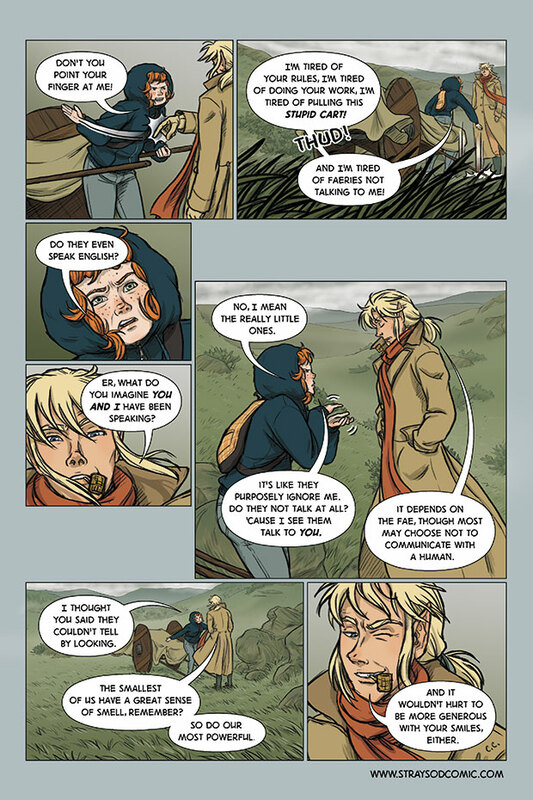 Now have that bookmarked along with your blog post of a while back “The Stray Sod Process: From Idea to Finished Page”. Even though not an artist per se [hopeful yearnings only!] found it to be a very interesting and informative post.